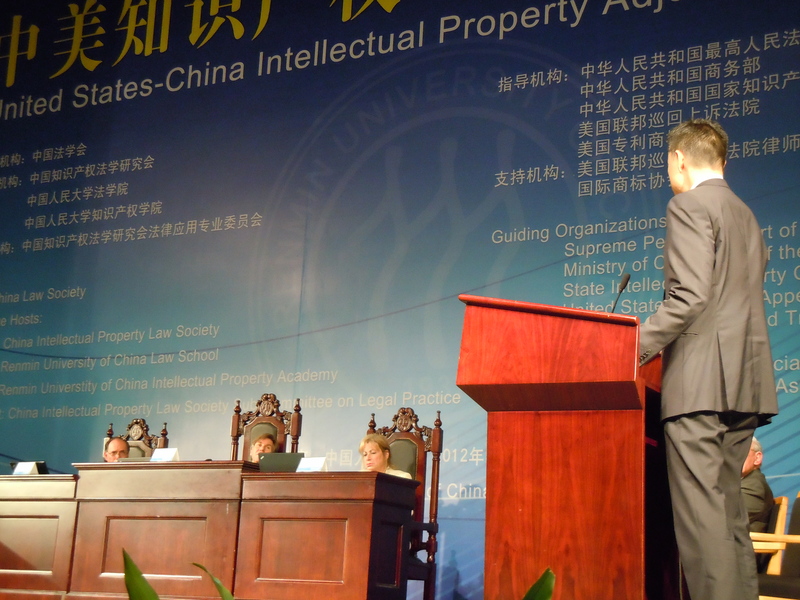 Judge Liu Yijun from Beijing IP Court spoke on the application of China’s IP Case Guidance System in Beijing IP Court. As we have previously reported, one of the latest development in China’s IP law is to build an IP cases system, which is being implemented in part as a case experiment at the Beijing Intellectual Property Court. Thanks to the continuing efforts of the Stanford Guiding Cases Project (SGCP) under the leadership of Dr. Mei Gechlik, a number of experts including Judge Liu Yijun from Beijing IP Court, recently spoke at a seminar at Stanford University to discuss current status and application of the IP cases system. The IP Cases System is one of several efforts to achieve more uniform application of law, encompassing such initiatives as national level “guiding cases” and other cases used for instructional or other purposes by national and local courts. Susan Finder’s blog had several posts about overall use of cases in China, including how Supreme People’s Court (SPC) uses case law to guide lower courts and the China’s evolving case law system in practice. According to Judge Liu at the Seminar, the Beijing IP Court is set to establish a principle that “subsequent cases should be adjudicated in accordance with effective judgements and rulings of prior similar cases.” At the current stage, judges of the Beijing IP Court are required to abide by effective judgements and rulings of the Court as well as upper-level courts that are applicable to the pending case. Meanwhile, judgements and rulings of prior similar cases from other courts at the same level should be referenced by judges adjudicating the pending case. Judge Liu noted that parties are encouraged to submit prior effective judgments and rulings and lawyers in response, are actively submitting more and more cases. At the end of 2016, the Beijing IP Court used prior effective judgements or rulings in 763 cases. Cases were submitted 657 times by parties, and voluntarily invoked by judges in 106 instances. Of those 763 cases, over 200 followed prior judgements, about 80 were distinguished on the basis of different facts, and the rest, around 480, were treated as completely irrelevant or not submitted via appropriate procedures. When this data is compared to the 8,111 cases concluded by the Beijing IP Court in calendar year 2016, the case citation rate was 9.4% of all cases, which was a big increase compared to the citation rate of 2.1% that we calculated in this blog for the first ten months of 2016. This IP Cases System can be accessed through an IP cases and judgments database (IP Case Database). In its trial version, we found 186 typical cases (典型案例), over 240,000 judicial judgments (裁判文书), laws and regulations (法律法规), intellectual property/legal index codes (知产码) (see www.faxin.cn) , opinions (观点), books (图书), journals (期刊), and review documents and decisions from Patent Reexamination Board of SIPO and SAIC Trademark Review and Application Board (两委文书). Many of judicial judgments included in the IP Case Database are a subset of judgments on China Judgements Online, which has over 35 million of judgments in total and over 260,000 judgments in the IP area. IPHouse (知产宝), another IP cases and judgments database, has recently told us that it has increased the total number of IP judgements on its database – their website lists around 350,000 cases, but we have heard that it is as high as 400,00. This is well in excess of the official China Judgments Online or the IP Case Database. The additional cases have reportedly been made available through direct outreach to various local courts. These 186 typical cases in the IP Cases System are currently all trademark related cases, decided between 2000 and 2016. A majority of those cases (112 cases) are actually SPC’s guiding cases, and only a small part are cases from High Court or Intermediate Court (11 cases from High Court in different provinces and 23 Cases from Intermediate Court). Among cases from Intermediate Courts, cases from the Beijing IP Court dominate. Panelists at the seminar at Stanford University suggested that all typical cases will go through a review process before posted to the database, which consists of review by experts, editing, and final review and release. But panelists at that seminar also noted that judges made the decision of which cases to be included in this database. It is unclear what criteria are used by judges and what judges’ role is through the case review process. To the extent that cases go through a curatorial process, they may also run the risk of being altered to serve particular doctrinal purposes – an issue that may have arisen with respect to other cases that have been considered model or guiding cases. As for the quality of those cases and judicial judgments, key words search of some well-known doctrines in IP law returns very limited number of results on the IP Case Database. For instance, a search of the doctrine of equivalents (等同原则) returns zero typical cases, which might be because no patent typical cases are included yet, and search of principle of good faith (诚信原则) gives nine typical cases (primarily for trademarks). A search for cases adjudicated by well-known judges returns similar results, with only one typical case adjudicated by Song Yushui (宋鱼水), who currently sits on the Beijing IP Court as its Vice President and was recently confirmed as an alternative delegate to the Central Committee of the CPC. Similarly, same key word search of the judicial judgments in the IP Case Database yields more results, but still relatively small compared to total number of judgments included. A search of doctrine of equivalents gives 81 judgments, search of principle of good faith returns 312 judgments (around one-third on trademarks, one-third on anti-unfair competition, and the rest on everything else) and 74 judgments are adjudicated by judge Song Yushui. Compared to another legal database pkulaw.cn (北大法宝), which combines cases and judgements, the same key word search returns significant higher number of cases and judgments (337 for doctrine of equivalents, 455 for principle of good faith and 255 adjudicated by Judge Song Yushui). Such discrepancy raises questions of whether the IP Case Database is currently comprehensive or easily searchable. One distinct feature to be noted of the IP Case Database is that each typical case has been given an indicator of whether the case should be followed or just referenced. My overall impression: cases are cited more frequently in Beijing IP Court and the case experiment will continue. It seems that the Beijing IP Court intends to attract attention and application of the IP Cases Database and make it a national tool in the near future. However, at the current stage, it is not clear whether their database has the ability to gain significant usage among the IP law community. Of particular importance is whether more cases, particularly patent and copyright cases, will be included, and when that will happen remains unknown. This blog has been prepared by Fan (Emily) Yang, JD Candidate, University of California Berkeley, 2019, with editorial assistance from Prof. Mark Cohen. The views expressed are the author’s own.